It’s so exciting every year to show the new energy that has emerged from the Papunya Tula Artists over the past twelve months. It’s never dull and always encouraging to see new talent sitting happily as part of one of the greatest community art organisations Australia has ever seen. The Papunya Tula Artists are heading towards a half century of operating as a company representing their community. An acheivement few businesses get to realise. This success comes from a combination of elements, the first of which must be the awesome talent of the founding artists and the nurturing and generous support of a long line of managers who have worked enthusi- astically to take their art to the outside world. 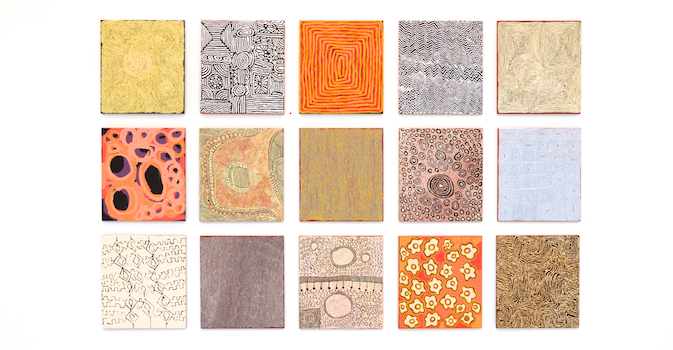 Papunya Tula Artists have been generous contibutors to their community and nurtured the next generations of artists who are now taking their place in the pantheon of Australian art. Utopia Art Sydney is very proud to be a part of this unique family and to have played our role in showcasing and promoting this wonderful community.